Members of the last crew to fly aboard the Space Shuttle “Endeavour” — the second-to-the-last flight in NASA’s space shuttle program — will discuss their recent mission to the International Space Station from 6:30 to 9 p.m. on Thursday, August 4, at The Johns Hopkins University’s Homewood campus. 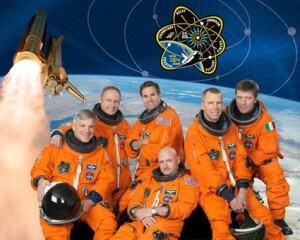 Participating astronauts include Mark Kelly, who commanded Endeavour’s STS-134 mission, pilot Greg H. Johnson, and mission specialist Mike Fincke and European Space Agency astronaut Roberto Vittori. This crew completed a 16-day mission to the International Space Station in June. Kelly, who is married to Arizona Rep. Gabrielle Giffords, announced in June that he would retire from NASA on Oct. 1 after 25 years. STS-134 was the second shuttle mission of 2011 and the last flight for Endeavour. Its mission was to deliver the Alpha Magnetic Spectrometer-2 — a particle physics detector that searches for various types of unusual matter by measuring cosmic rays – to the space station. Experiments with AMS are helping astrophysicists study the formation of the universe and to search for evidence of dark matter, antimatter and strange matter. The mission also flew the Expedite the Processing of Experiment to Space Station (Express) Logistics Carrier 3 (ELC-3), a platform that carried spare parts that will sustain space station operations now that the shuttles have been retired from service.